Once a year, on my birthday, my wife gives me a gift. I get a day off to do what I want, usually catch up on comics walk around the city aimlessly. So on this winter day, 1/19/09, some amount of days after my birthday, I enjoyed my day off, damning the snow. 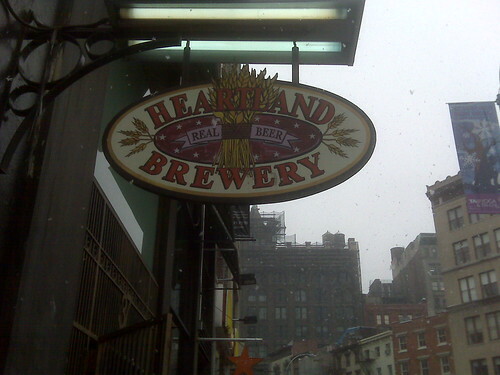 In my journey, around Union Square I stumbled upon Heartland Brewery. Then a light bulb went off in my grey matter, burned a little. I first read about this place and their Coffee Porter in Ale Street news, and it stuck in the back of my head till then. 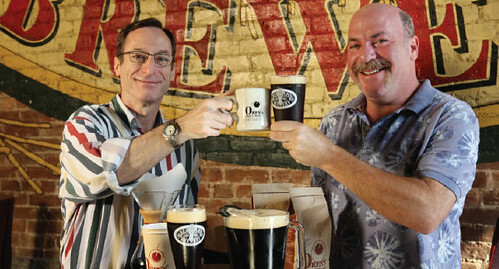 Their Oren’s Daily Porter, a limited edition coffee-infused ale (6% ABV) created by Heartland Brewery’s founder Jon Bloostein and his brother Oren of the coffee roastery Oren’s Daily Roast. Do You Folks Like Coffee? Real Coffee, From the Hills Of Colombia? … Prepare For Ultimate Flavor! You’re Gonna Get Some… now. Heartland Master Brewer Kelly Taylor made the Porter with highly kilned English and Belgian malts and handpicked Colombian micro-lot coffee directly sourced from small farmers in the Andes. This complex, java-flavored, highly aromatic beer is available on tap at all Heartland Brewery locations ($6.95). To make your drinking really worth while, a dollar from each purchase goes to International Rescue Committee’s efforts to provide clean water to the people of Ethiopia, something the Brewery has been supporting for years. Presentation/Color/Clarity: The Beer was brought to me in a proper pint glass and had the look of a thick stout or a black coffee with a light creamy head. Smell, hop aroma: I got that it was coffee porter right away. It had the aroma of strong brewed coffee coming off the glass. Body: The beer had a full dark porter body, closer to a stout, though, in mouth feel. Sweetness: Even though it was not too sweet in was sweeter and maltier than most beers. Spiciness: The hops – This beer seemed to have aromatic hops and had very little bitterness to it. Flavor: The overall taste of this beer was rather astounding, I must say, one of the better-quality coffee beer marriages I have had. Balance: The porter was the yin, the coffee was the yang, nuff said. Complexity: This beer was not that complex, it flowed all over your taste buds. Alcohol feel: With an ABV around a 6.o, it was not that bad, I must say. Drinkability: Well I really like this beer, I REALLY like this beer, I WILL have it again. What about the packaging? This pint glass was dedicated to the beer, it was a nice touch. Pairings: This is a beer, @ breakfast will go well with bacon, and French toast with maple syrup, or a REALLY good croissant with a little butter. For lunch/dinner this would go well with anything roasted. Comic Pairings: I actually drank this porter while reading DC’s Detective Comics. This is a porter with a bright, distinct java taste (and about 1/8 of the caffeine found in a 12 oz. cup of coffee), Batman (Rest in Peace Dark Knight, till you become a Black Lantern) would drink. Portion of proceeds to support International Rescue Committee For Immediate Release (New York, NY) — Heartland Brewery http://www.heartlandbrewery.com founder Jon Bloostein and brother Oren (Oren’s Daily Roast http://www.orensdailyroast.com ), the owners of two multi-unit New York City beverage-focused businesses, have combined their love for beer and coffee, respectively, to create Oren’s Daily Porter, a limited edition ale (6 % abv) available on tap at all Heartland Brewery locations (addresses below) this holiday season. Working closely with Oren, including visiting his roastery, Heartland Master Brewer Kelly Taylor made the porter with highly kilned English and Belgian malts and hand-picked Colombian micro-lot coffee directly sourced from small farmers in the Andes. Oren’s Daily Porter is a complex, highly aromatic beer with a bright, distinct java taste (and about 1/8 of the caffeine found in a 12 oz. cup of coffee); drink it on its own or pair it with a roasted meat on Heartland’s menu. Jon Bloostein observes, “This is the first time that my brother and I have collaborated on a beverage and I know that our respective customers are going to enjoy it. How we each found ourselves producing two of the world’s most popular drinks is a mystery to both of us (and our mom), but the common denominator is water, which is why the charity we’ve chosen to give the proceeds to makes so much sense.” One dollar from the sale of each pint of Oren’s Daily Porter will go toward the International Rescue Committee’s efforts to provide clean water to the people of Ethiopia; a cause that both brothers have supported for years. Very interesting post, as are some of your other posts. I have bookmarked your great site for future visits.